We have a new publication in IOVS, Pattern Recognition Analysis Reveals Unique Contrast Sensitivity Isocontours Using Static Perimetry Thresholds Across The Visual Field (Direct link here). Authors are: Jack Phu, Sieu Khuu, Lisa Nivison-Smith, Barbara Zangerl, Agnes Yiu, Jeung Choi, Bryan W. Jones, Rebecca Pfeiffer, Robert Marc, and Michael Kalloniatis. To determine the locus of test locations that exhibit statistically similar age-related decline in sensitivity to light increments and age-corrected contrast sensitivity isocontours (CSIs) across the central visual field (VF). We compared these CSIs with test point clusters used by the Glaucoma Hemifield Test (GHT). Sixty healthy observers underwent testing on the Humphrey Field Analyzer 30-2 test grid using Goldmann (G) stimulus sizes I-V. Age-correction factors for GI-V were determined using linear regression analysis. Pattern recognition analysis was used to cluster test locations across the VF exhibiting equal age-related sensitivity decline (age-related CSIs), and points of equal age-corrected sensitivity (age-corrected CSIs) for GI-V. There was a small but significant test size–dependent sensitivity decline with age, with smaller stimuli declining more rapidly. Age-related decline in sensitivity was more rapid in the periphery. A greater number of unique age-related CSIs was revealed when using smaller stimuli, particularly in the mid-periphery. 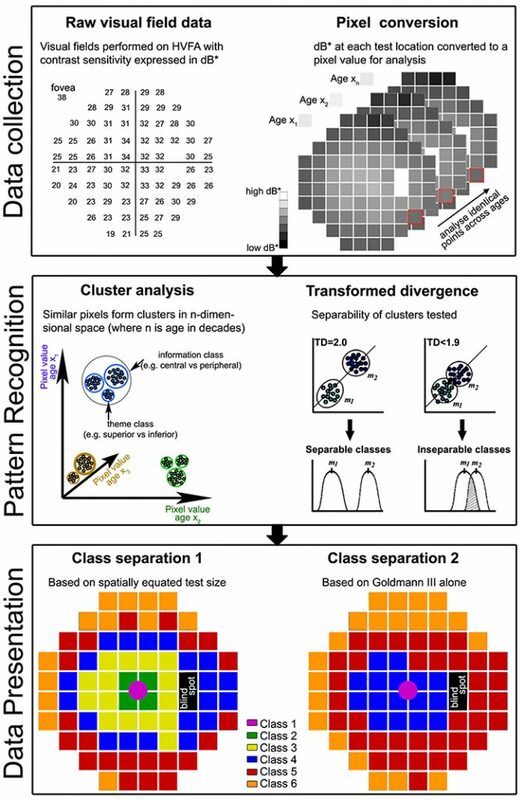 Cluster analysis of age-corrected sensitivity thresholds revealed unique CSIs for GI-V, with smaller stimuli having a greater number of unique clusters. Zones examined by the GHT consisted of test locations that did not necessarily belong to the same CSI, particularly in the periphery. Cluster analysis reveals statistically significant groups of test locations within the 30-2 test grid exhibiting the same age-related decline. CSIs facilitate pooling of sensitivities to reduce the variability of individual test locations. These CSIs could guide future structure-function and alternate hemifield asymmetry analyses by comparing matched areas of similar sensitivity signatures. 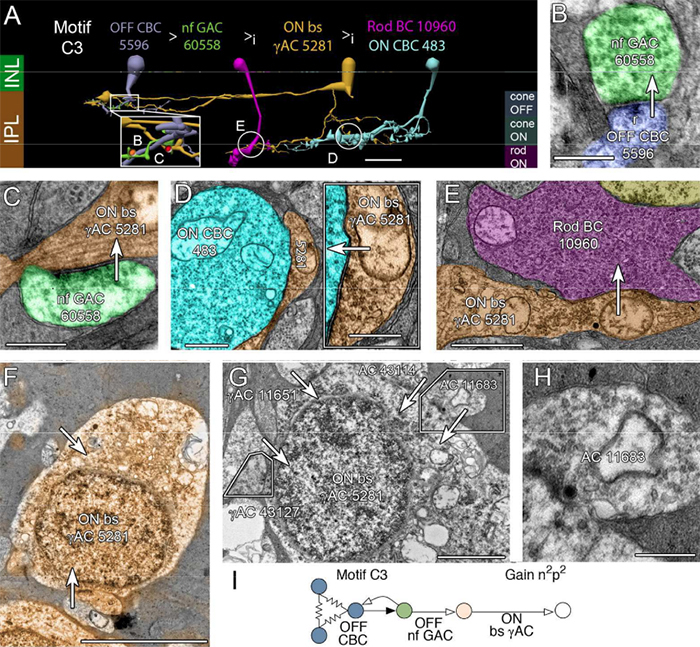 This entry was posted in Publications and tagged Agnes Yiu, Barbara Zangerl, Bryan Jones, Bryan William Jones, BWJones, ganglion cell, IOVS, Jack Phu, Jeung Choi, Lisa Nivison-Smith, Michael Kalloniatis, Rebecca Pfeiffer, Robert Marc, Sieu Khuu, visual field on September 20, 2017 by bwjones. This abstract was presented yesterday, May 7th at the 2017 Association for Research in Vision and Opthalmology (ARVO) meetings in Baltimore, Maryland by Nayuta Yoshioka, Barbara Zangerl, Lisa Nivison-Smith, Sieu Khuu, Bryan W. Jones, Rebecca Pfeiffer, Robert Marc, and Michael Kalloniatis. This entry was posted in Abstracts and tagged ARVO, ARVO 2017, Barbara Zangerl, Bryan Jones, Bryan William Jones, BWJones, Lisa Nivison-Smith, Michael Kalloniatis, Nayuta Yoshioka, Rebecca Pfeiffer, Robert Marc, Sieu Khuu on May 9, 2017 by bwjones. This abstract was presented today, May 2th at the 2016 Association for Research in Vision and Opthalmology (ARVO) meetings in Seattle, Washington by Michael Kalloniatis, Robert E. Marc, Sieu K. Khuu, Jack Phu, Barbara Zangerl, Lisa Nivison-Smith, Bryan W. Jones, and Rebecca L. Pfeiffer. Purpose:To identify areas within the visual field with matching contrast sensitivity (CS) signature patterns as a function of age using pattern recognition and determine the discrimination of CS data when using spatially equated test stimuli compared to the single size Goldmann (G)III alone. Methods:52 subjects (classified in decade age groups from 20-60+ years) were tested using the Humphrey Visual Field Analyser 30-2 paradigm in full threshold mode for GI to GV. At least two thresholds were obtained per size. Two visual field maps were analyzed: a spatially equated visual field where GI was used centrally, GII mid-peripherally and GIII in the outer rings to place the test size at or close to complete spatial summation and a second where a single GIII was used at all locations. Thresholds were expressed as dB* (Khuu & Kalloniatis, IOVS 2015), converted to pixel values and analyzed using an unsupervised classification using isodata clustering (PCI, Geomatica, Canada). Class separation was extracted across the ages to develop dot plots of decade measures of CS. 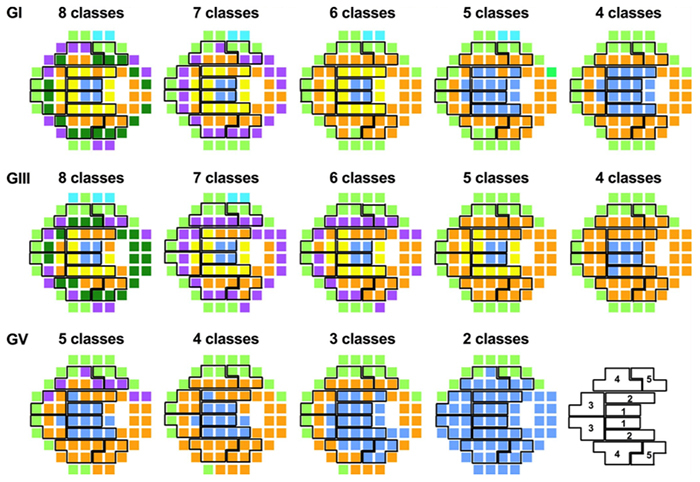 Results:The 77 data points across the central 60° visual field can be distilled into 6 functional classes using the spatially equated visual field (Class separation 1). The 6 classes reflect areas in visual space that change in a similar manner across the ages. The use of the single GIII target resulted in only 4 classes displaying a poorer discrimination over the central visual field (Class separation 2). Extracted dot plots from class separation illustrated average CS within each class could be assessed across the decades. Conclusions:When using spatially equated visual field testing, concentric areas were separated into distinct CS signatures consistent with known visual field sensitivity. We confirmed these areas change systematically with age. 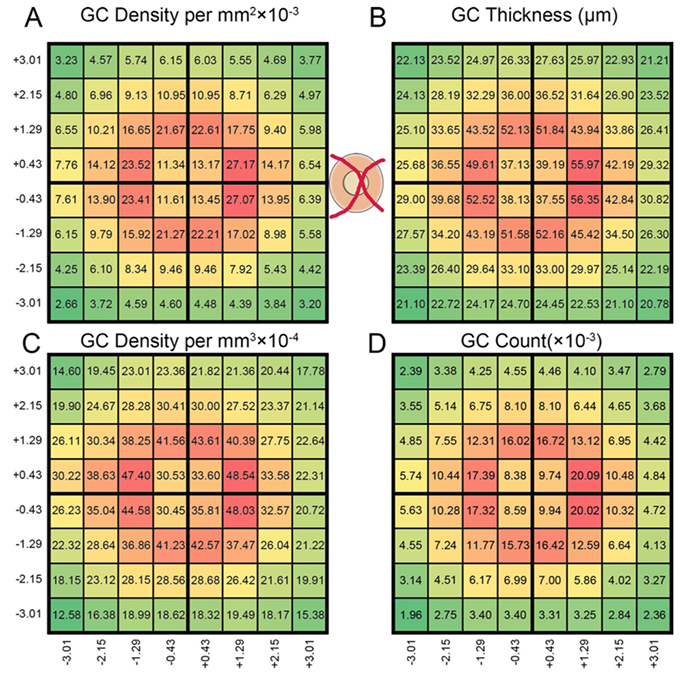 GIII failed to discriminate central areas of the 30-2 that likely reflects the fact that this size operates outside complete spatial summation and thus may not be the optimal test size for assessing visual function in the central visual field. More importantly, we showed pattern recognition can be applied to complex visual field data sets to identify common features and age-related visual function changes. This analysis allows regions to be averaged as they are statistically identical: this approach will likely assist structure-function studies. This entry was posted in Abstracts and tagged Barbara Zangerl, Bryan W. Jones, Jack Phu, Lisa Nivison-Smith, Michael Kalloniatis, Rebecca L. Pfeiffer, Robert E. Marc, Sieu K. Khuu on May 5, 2016 by bwjones.